It seems that every innovation story you hear today comes out of a startup. Big companies are often described as dinosaurs, slow with trouble pivoting. So what can big companies do to ensure they too make it a habit of creating an environment for disruption? Big companies today would benefit from thinking about what they can do to prepare for a new environment where business changes at every corner. What can big companies do to make themselves more nimble, better able to pivot and competitive in the marketplace? 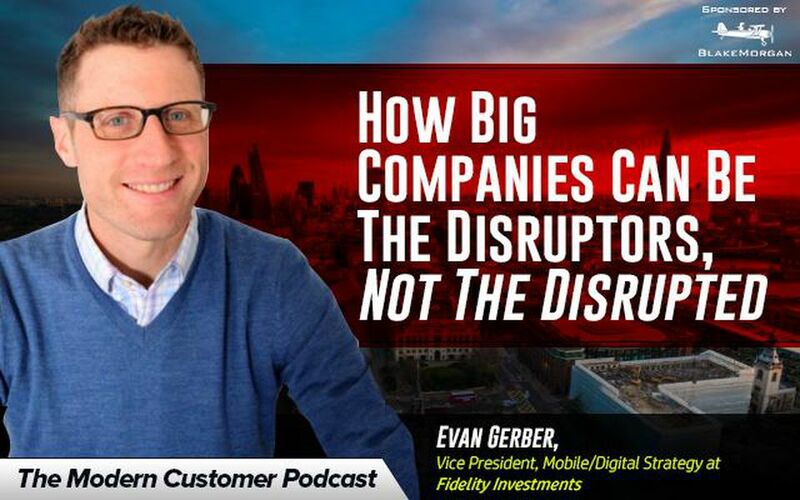 Evan Gerber, VP of Digital Strategy and Mobile at Fidelity, knows a thing or two about disruption. He believes big companies can be just as innovative and disruptive as small companies—they just need the right approach. An avid technophile and self-proclaimed device geek, Gerber is fascinated by the interplay of business, technology, and consumer behavior. Evan’s first engagement in the mobile space was over a decade ago, and he has been at the forefront of developing customer experiences across multiple devices ever since.